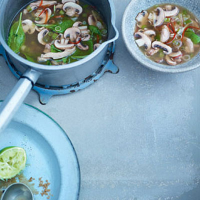 An Asian style soup, perfect for using up leftover chicken. Remove the tough outer leaves from the lemon grass and cut the tender inner flesh into rounds. Put this, the ginger, salad onions, chilli and stock in a large pan and bring to the boil. Simmer for 10 minutes. Cut the chicken into thin strips. Add it to the stock with the mushrooms, fish sauce and sugar, and simmer for about 3 minutes, or until the chicken is cooked through with no signs of pink. Stir in the spinach and lime juice. More lime juice, sugar and fish sauce can be added to taste.